Is everyone ondering what will happen on the street with Dong-hoon and his wife? Because I am. I have a feeling that Dong-hoon won’t bring up anything serious right at that moment though. He seems like the kind of person that will keep it in until he can’t keep it in any longer. DH is sitting at a coffee shop looking at nothing. He has his drink and food in front of him. His collegue asks where he is, he called him many times, you should come in. The colleagues looks behind him and we see DH’s desk being ransacked. JA goes to her seat and the colleagues keep talking. Maybe they saw it all their party, what did DH say?….He just told me to leave it alone. DH sists and thinks about the recent past. VO – That money, it was on purpose, they wanted to fire you. He thinks back to meeting his wife at the phone booth. His wife comes up to him, why are you here without calling me. He says he just stopped by. They decide to eat lunch together, but he just eats and eats and does’t talk. She wonders why he isn’t saying anything and is just talking, you didn’t just stop by to eat lunch did you? But he says that he just stopped by. She wonders, did you think about opening your own business. DH says that other women want their husband to stay witht he company, but yo are different. She says that those men don’t have skills, but you have skills. I know how they treat you so don’t live like that with your old age. Present. DH is across the street from the booth and is spying on it from the cafe. He sees his wife going to the booth and making a call. She calls JY. DH sees her alling someone and his face sinks as he looks in front of him at nothing once again. Then we cut to him making a phone call from the booth. He waits and J answers, oh, what is it? I have to go to a meeting, i will call you later. He hangs up abruptly and DH just holds the phone in stunned silence. Umma tells SH to call DH, he isnt’ picking up the phone. SH thinks he is working, we shouldn’t call him all the time, it might be dangerous. KH calls him and tells him that Umma made gomtang, so come home. Umma takes the phone and asks DH if he is sick, cheer up, did you work hard? You should eat even if you are busy, I made gomtang so come and pick it up. Bye-bye. The other brothers say the mother should be that nice to them but she just snaps, turn off the TV! Cut to DH walking the streets. He has a mini flashback of being in a car. He looks for something int he car and finds a parking card from the Minette hotel. He cleaned the roof with it, thinking nothing at the time. But now he is at that hotel and looking up at it from outside. He sees his a white card and hides, it is his wifes car. he sees her going into the hotel. Then director Park calls him. But DH doesn’t answer and sees another car going to the hotel. It’s JY. DH looks on stunned and doesn’t answer the phone. DH calls his wife and asks what she is doing. Umma wants you to pick up gomtang. She says she is busy, he can take the car to pick it up. DH hangs up and takes a drink from the bar. this isn’t his normal bar. Wang2 gets a call from Director Park. It looks like the inspection team searched DH’s desk and Wang2 wonders if this is related to him. Park says he gave the phone directory to DH. Wang3 tells him not to call DH until he figures out waht is going on. Meanwhile, DH is just into his mind as he thinks about JY and his wife and how JY started acting nice to him all of a sudden…it was last spring…..he imagines JY and his wife sleeping together. DH falls asleep on the couch with a blanket around him. his wife comes in and goes to her room. His eyes are closed, but then he opens them. It’s morning and DH is walking to go to his sons soccer practice. Cut to the soccer team practicing. The three brothers are all there together as they watch the kids play. DH walks up later and goes directly up the steps without saying hi. The men all joke that he is going straight to the restroom, he must have drank a lot. But DH just sits on the toilet thinking. Flashback to his wife laying into him about drinking again. He just drinks. You look like a cow going to the slaughter house. Look at how everyone else lives. But he says it is the same, everyone is the same. The men shoot the breeze outside. they are all drinking morning soju, there are bottle ond bottle on the table. that is crazy. DH comes out and goes straight to the field to play without stretching or anuthing. Okay, it looks like some ajusshi’s are playing soccer against little kids? While playing, DH thinks about conversations between him and his wife. His wife thinks his body is there with her, but his mind is with his family. He should have lived in the Joseon dynasty where he takes his wife and family to the inlaws. We see DH with his son as a baby at his mothers house. KH thinks, wow his wife is cool, she became a lawyer after having a baby. Umma says she is sorry she isn’t as cool. But the brother just says that is why women are poor, because if the brother passed the bar exam then the wifes family would have a big party. Umma tells DH that women won’t be able to see men under you, so you need to get promoted. (Women want men in stronger positions then them). DH thinks about all of this while playing. But he gets frustrated and takes off his hersey. He yells that no one gives him the ball so he is leaving. All the teammates on the side wonder what is going on as DH grabs all his thinks and walks away. A little bit later we see him wearing his jacket and walking up the street. Meanwhile, SH tries to call him. KH lays into one of the other players about how he knows they play well but he should have given his brother the ball. He works all day and it is difficult to play soccer for him. he is better at it than you. the same team mates start to fight with KH leading it. The other team are like 12 year olds. the coach groups them up and says that they shouldn’t play against these old men, who called them? One of the kids fathers called them. The coach tells them to look at that…. (the police came,lol)….The coach tells them to not be like that, whose father is it. JA is listening to DH as she runs to find his location, she hops on the bus and has GPS on his phone as well. DH is by the river. Maybe she thinks he will jump into the river? She runs and runs and runs to get to the river. DH is just standing by the river and looking at the subway trains go by. But then he turns and starts walking across the bridge. JH is still listening to his breath as she runs to find him. She finally sees the back of him and stops. Someone yells at him…ah it is his brothers. they yell, where did you go to? Why didn’t you pick up the phone, you are not a little kid! We were looking for you, pick up your phone, where were you? JA turns and walks back in the opposite direction. The two affair people are outside camping with a tent and everything. JY is stocking the fire as JH just enjoys the air. They talk a little about camping and about how someones background at the company is outdoor things. YH says that it is good to come out. They both start drinking and Y asks who he talked to with that phone. He left right away. He asks her who she thinks that person is….It is the kid that is working to fire DH. JH wonders, is it the same girl with the crime history? She is a dangerous girl, she isnt’ normal. JY says that his work isn’t normal so he can’t asks a normal person to do it. When he is done then we can take care of her quietly. The actress brings even more actors/directors/movie people to KH’s place to humiliate him. But he isn’t answering his phone and is instead out with his brothers. He calls that woman super bad. he will come back in another life as a super rich person. DH jokes that all the people he meets now are the ones he wanted to get revenge against in a previous life. KH thinks he should just finish this life and not get reborn again, but one of the brothers thinks that is too sad. he likes his life. they keep shooting the breeze about that. Cut to the bar, RY went there to meet him but the bartender went there and told her that KH isn’t there today. they are meeting outside as they talk. One of the friends comes outside and gets extactic when he sees her. He acts super surprised and says that he used to clean up her throwup in that building. She tries to smiled it off. They ask her if she is still drinking. She says that she is happy without drinking. the bartender wonders why? Is it because KH isn’t successful? The actress smiles asd says that she doesnt’ know. But the bartender says that she knows it is true, she has the same feeling toward another man. The actress puts up her hand and calls her comrade. The friend hits it in a highfive. Meanwhile the brothers walk back. SH tells him brother that men have two puberties, so don’t try to kick balls like you are young. DH gets back to his building and sees his wife going inside. He pauses, but then he runs to catch her. he pushes the door open which scares her. She says he went out to play soccer in the morning, but only just came back now….super great. She sighs and turns her attention back to the elevator. They ride the elevator up and DH asks her why she smells like fire. She says it might be because she had a BBQ. he looks away. they go to their home and DH watches YH go about her regular activities with a heavy heart. He takes off his jacket and shakes it off on the bed. He is still very drunk. JA looks at the cell phone while someone knocks on the door outside. it is the thug dressed in a clean black and white suit. But he is drunk and is nocking on the door loudly over and over again. Then he tries to pick the lock. he picks the lock and goes inside. JA and her grandmother are both scared to see him. He wonders why they are so surprised, he knowcked on the door for a long time. He greets the granmother like a psycho, he says that he wondered how she lived and if she was still alive. JA pushes him away from her, but JA just knocks her away and says that he won’t do anything to her, she will die anyway. GI sits on the floor and tells Halmoni that today is his fathers memorial day. Your granddaughter killed my abonim, we should share the food from the memorial service, but i have no one to share with. Eat this. The grandmother doesn’t want to. But he says to eat this and live long so your granddaughter can suffer for a long long time. But she doesn’t want to eat it and JA attacks him. All hell breaks loose as GI yells, do you want the father and son to have the same memorial day!! Cut to later on, we see JA with bruses all over her face. She listens to DH’s recording saying that she is a good kid (a good girl). All she does is listen to this while sitting on the steps outside her house. DH is being interviewd byt the company. A man wants to know what he was doing yesterday, why did he make so many calls from his office. DH wonders why that is strange. the man says that he thinks DH is investigating why Park was fired, it will be bad for everyone. Everyone will be talking about it. If you have something, then just give it to me before a rumor spreads. Just give it to me. DH says that the CEo owns the inspection team, so no one will give you anything to investigate JY. DH walks the hall back to his office and runs into another suit who wonders why they called him in the office, it is okay, you can just tell me. JY comes around the corner at the same time and smiles smugly. He basically says that DH shouldn’t poke around behind his back, it makes it look like he is doing something bad. Meanwhile, JA is making copies. the annoying woman is there, she gives JA a hard time but leaves and the man that got slapped tells JA to give him some paper. She just opens the paper drawer without giving it to him. He slams it shut and yells at her, she should give him the paper! This makes the entire team look at them. DH calls two people to the side. the annoying woman says that they should fire JA, she makes all the mood bad, that is my opinion. DH asks his other team member what is going on. the team member says that she always opens the paper drawer with her foot. Then the colleague says that JA slapped that guy really hard in the face. Assistant manager thinks JA hit him maybe because he spit a lot. But the other guy thinks that the assistant manager hit him because he said something to her. DH goes outside and talks to JA about why she hit that man. She says it is because he was talking badly about him. that it is all his fault and why does he still stay in the company. DH stops talking and JA walks away. They both ride the subway. DH looks out the subway window and JA looks at him. They don’t talk. The collegues are drinking, the assistant manager can’t believe he just did that/said that to DH. DH calls him on the phone and tells him to tell him that he is sorry 10 times. The man starts yelling that he is really sorry over the phone. DH says that they shouldn’t do these things to each other, he shouldn’t feel hurt from his team as well. The assistant manager cries and tells DH that he is really sorry and he loves him. The chubby colleagues tells the asistant manager to drink. But he apologizes and says that it was his fault. they are quiet for a moment. then he tells her thank you….for slapping him. he walks away and she looks at him. But we cut to them drinking together. Dh says that when she hears someone bad talking someone else, don’t say it. It is good among kids, but among adults it is bad. that adult will avoid you because they will feel uncomfortable. DH drinks shot after shot as they sit. DH – I will pretend like I dont’ know it, whatever I hear about you, i will pretend like I don’t know. And whatever you hear about me, pretend the same thing. i am scared…because for you, even if you don’t say it, I feel like you know everything. the actress is in the building and walking around with a super short skirt on, lol. She is so happy to be around KH. She says that she is so happy now. She wakes up in the morning now. She was so deptressed this past winter, but now she feels like her heart is in Spring. She sits with the brothers and happily smiles as she watches them eat. She says that she feels so special, sitting there like that, together with this shiny genius’s failure. When someone has a shiny moment, failing also looks like something is there. KH gets up and says that she thinks I am a gentleman, you have never been hit by a man right? If you are successful then I am okay right? I was a bad director. But you, you are also not successful, if you were a good actress then other directors would have found me But you wre also bad at acting. I failed because of you, you made me fail! YR leaves and asks SH if people still drink vending machine coffee. SH says it doesn’t matter and KH comes out and tells her, aren’t you leaving? If you come here again…. But SH asks him why he is doing that to that woman? KH tells him that she is the worst person in the world and doesnt know what is going on. The company man talks to Wang about the situation. DH thinks the bribery money is to F him so he is looking into it. Wang wants to know why he didn’t give what he had to the company man. the company man says it is becaue DH thought he was with JY even though he said he was with Wang. Wang goes and meets with DH again. He asks DH what kind of sports he likes DH says soccer. Wang says he is too old for soccer. The CEo and Yoon run up to Wang and DH. Wang says they might be able to do volleyball soccer some time. they walk away and JY starts to brown nose Wang, do you want to go camping? Yoon talks to Dh and tells him the chairman likes weaker people. He talks to cleaners. The chairman knows how to handle people, but if you dont’ work well then he changes. I have experineced it, be careful. he pats DH several times on the shoulder. DH stops by the local corner store and gets a coffee. We see him through the window. he pulls out his phone and calls someone. It is his wife. the wife picks up so he asks when she is coming back. She says she is almost finished. he wants to eat dinner with her but she says that she ate dinner. He tells her okay. But in actuality she is with JY at the hotel. JY asks if she is sure that DH will quit, it doenst’ seem so. JY says he has to prepare a lot to open his own business, don’t do anything. He asks if she still loves him, it sounds like it. JY says, what if he turns into a badk person after he gets fired, don’t worry, he will quit soon. the starlet is at a bar with her friends. The friends talk about KH and how he punched the other director. He won’t be able to do that movie anymore. But the starlet isn’t talking. She is very quiet. She tells them to shut up, she was the one who got hurt, not them. She was the one broken by him, that is why they hang out with her, because they want comfort from her. We talk bad about him all the time, but he was a big star and you all are trash. She leaves and walks stone faced through the rainy streets. She goes all the way to the brothers cleaners and waits on the steps outside. Inside, KH is talking to someone on the phone about paying them the cleaning fee. He says this with a bright smile and tells the person to please pay the cleaning fee. SH tells KH that he should go outside, her legs will freeze. But KH just tells him to ignoreher, she just wants to get attention. he tries to make another call, but he slams the phone on the ringer and goes outside. KH – leave, leave before I call the police. YR – I hope AI time comes quickly, AI does the best acting, studies well, is loyal and does the best. I hope man can’t brag about anything. then we don’t have to brag about anything, how free wil we be? We will only have to love. I am sich and tired of this workd that is full of braggers. i am not good at anything so I feel like I am dying. She looks up at KH. YR – I want to come here. But he just goes back inside and leaves her there. She lowers her head and cries a little. But then he comes back out and puts some change in the coffee vending machine. Hea sks her if she wants black or mixed coffee. Dh is sitting on the couch and staring at the TV. YH tries to talk to him about taking a loan, a business loan and if he looking into it. She looked into it, it is 4%. they can go to the bank together when they have time. But then she goes to the window, opens it, and sighs. It looks like she is suffocated being with him. She just feels the air for a moment as DH keeps looking at the TV. DH takes a bus to the countryside. He gets let off on the side of the street and starts walking up the street. he does not look prepared to stay for a long time though. he only has hisjacket and no bag. But he keeps walking up the street to some park. He gets to the woods and walks through it. Hmmm, perhaps this is the park that JY mentioned to Wang? It is!!!!! DH walks up on them. Wang – Hey, that’s manager Dong-hoon right? DH walks up to them. I agree. He will keep it in until he figures out his next move. V, do you find this kind of a hard show to recap because there is so little dialogue in many scenes? Bong Ae watches the moon. Both hearts beat as one. I love it because I can breathe a little bit. But I do struggle to explain how poetically pretty something is. I love what you wrote! We will be recapping Little House In the Forest Friday which will be mostly description. That will be my practice for describing mostly scenic scenes. I can’t wait! so my guess… he wont do anything, unless it blow up in his face beyond salvation. 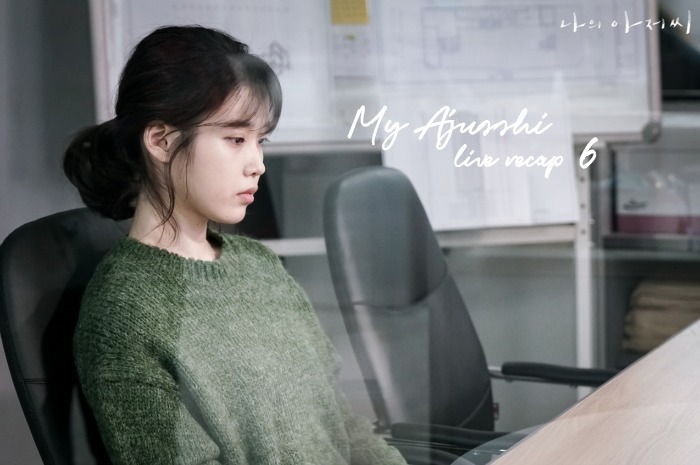 i am such a bad person, i actually had meetings and studies these few nights, and i was giving crap excuses just to run home to watch ahjussi LIVE and thru cable TV TvN, promising my boss i will finish my workload at home on my own.. ahhahha. V. i am all depending on your expertise in understanding all the dialogues for all your invaluable recaps. massive tks. don’t try to peek because you wouldn’t be able to live. am telling you from an experience. Finally caught up with all 6 episodes this weekend! Totally into this. So much depth to the character. I think I am enjoying this more than Misty. Even though its dark, I like the subtle humor that shows up without actually trivializing the issues. Look forward to joining the live recaps this week onwards! Have a good week!